The guy calls it "treason". Sorry, no, simply letting people see these images is not treason. If they think people thinking about this will cause unrest, then maybe they shouldn't have massacred all those people. the crime of betraying one's country, especially by attempting to kill the sovereign or overthrow the government." Where the government of China sees itself AS the country, I think there's a good chance they will see it and treat it as treason whether you think it qualifies as treason under your own personal definition or not. "the action of betraying someone or something." Pretty sure this qualifies. Remember that even beyond whatever you personal definition is, there's a difference between the common definition and a legal definition. Treason depends on where you're standing. 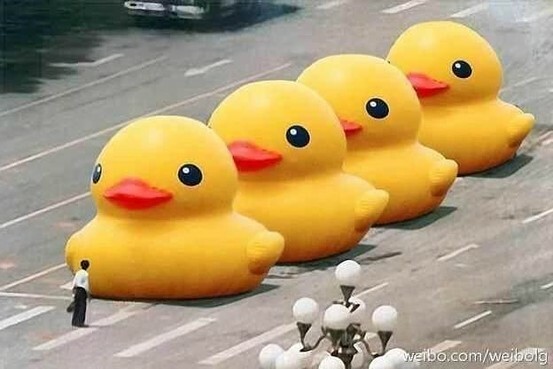 I imagine to a patriotic Chinese citizen, their government might appear quite treasonous for massacring unarmed citizens protesting their government's wrongdoings. And as we are currently seeing in our own countries, when the people of a country become too lazy and distracted to actively participate in their own governance, their government can be co-opted by individuals motivated primarily by personal gain with little care for the greater public good. For example, many in the US government support the passage of the TPP which will almost certainly export a significant number of jobs and give large corporations the means to coerce governments (via ISDS) into not passing laws that serve the greater public good if those laws are perceived to adversely affect profits. Now, if the US government is causing harm to its own people - and then writes laws to prohibit public comments critical to the TPP - and then I break those laws by posting critical comments - which of us is more a traitor? Treason from the perspective of the Chinese government? The person doesn't seem to be particularly against Baidu's actions, at least not on principle. "Treason" is whatever the government wants it to be. And their family billed for the bullet. But it's also a reminder of why we should be so thankful for strong intermediary liability protections in the US, and how not having such protections is a sure path to censorship. Which are under fire, because copyright. There are indeed many ways to impose censorship. If you disagree with government, work to get the laws changed. This sort of reckless lawbreaking will be severely punished and those involved deserve everything that's coming to them. ...said the Chinese intelligence agent. What can you do that is legal, when criticising the government itself illegal?